Bird baths are essential for every bird-friendly landscape. While there are many different types of bird baths you can buy, there are even more ways to create your own bath with upcycled, recycled, or repurposed materials, no matter what your level of crafting skill. These 10 creative projects offer plenty of opportunities for creativity and personalization while still providing water to your favorite backyard birds in fun and imaginative ways. 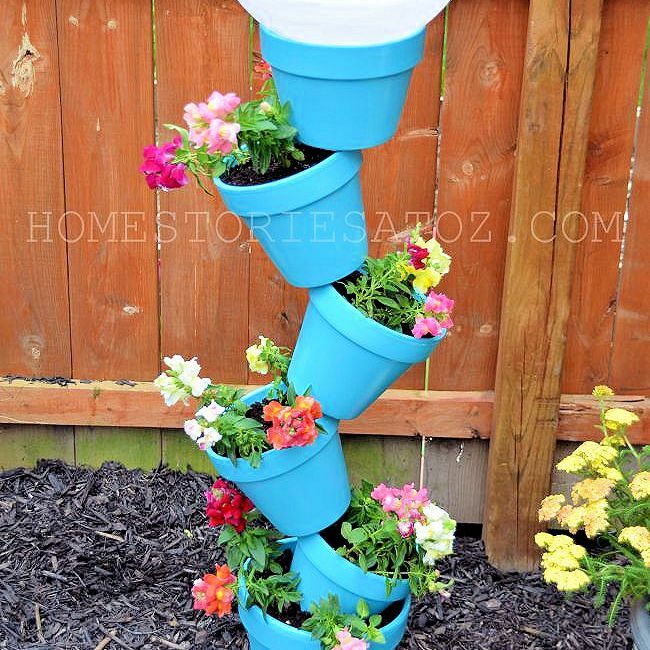 There are many ways to use clay pots to make DIY bird baths, from simple towers to creative stacking, but this topsy turvy design is one of the most fun and whimsical options. Bold colors make the project pop, and the tipped pots make perfect planters for flowers, herbs, ferns, or other greenery. Add flowers for hummingbirds or seed-bearing flowers to attract even more birds. Pedestal bird baths are popular designs, but your pedestal doesn’t have to be boring or plain. Recycling glassware is a great option for a bird bath with extra sparkle and flair, and who doesn’t have old vases, platters, and plates gathering dust in a cupboard or piling up at a thrift store? Put them to good use by creating a bird bath that will add vintage style to the yard. Add storybook whimsy to the garden and invite birds to a tea party with this teapot bird bath stack. Mismatched cups, saucers, and teapots can blend together with a coat of paint, creating a memorable and fun design that is a great companion to a teapot birdhouse. Use your own miscellaneous crockery or visit thrift stores or yard sales for a wide variety of choices to turn into a DIY bird bath. This stacked bird bath allows you to express your creativity with different colors and by filling the stacked vases with a variety of items. Try pebbles, marbles, colored gravel, seashells, colored sand, yarn scraps, tumbled rocks, or any other fun fillers for unique colors and textures. The wood slice separators give the project consistency as well as good stability. The rustic look of this simple stone stack will add structure and an easy water feature in more natural gardens. Galvanized trash can lids are perfect for bird bath basins, and if the lids are a bit bumped and dented, so much the better for a weathered look. Stones added inside the basin give birds more perching space and keep the lids sturdily in place. Hanging bird baths are a great choice for hanging below balconies, from awnings, or from large tree branches, and this easy glass lid bath is a simple but perfect project to attract birds with water. The chain adds durability and stability to hang the bath, but the lid can easily be removed to wash (even in the dishwasher) when it is time to clean the bird bath. Dollar stores and thrift stores have a wide variety of colorful serving bowls and platters that can make stunning bird baths. This project adds even more custom flair with a carved table leg (recycled, of course!) as the pedestal, complete with a stability platform to be sure the bird bath can support all its feathered visitors without tilting or tipping. 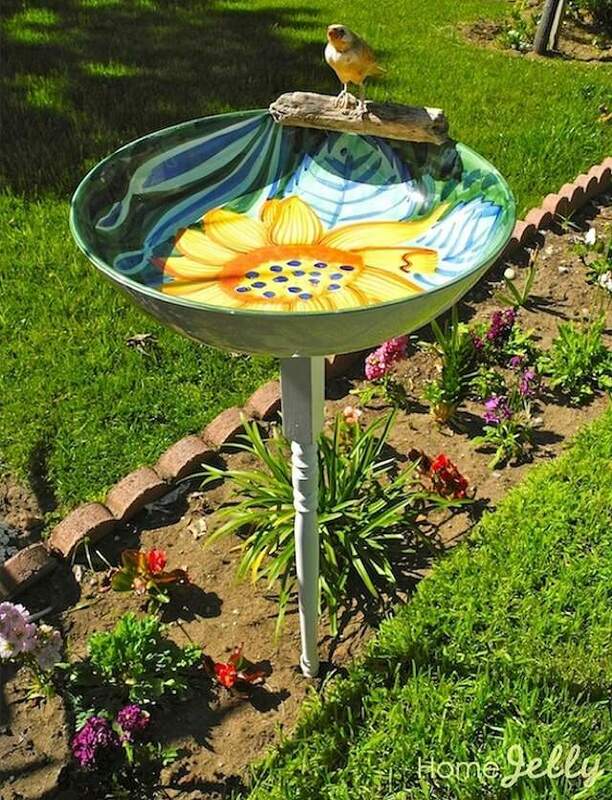 Turning an old lamp into a DIY bird bath is one bright idea, and you don’t need an electrician’s license to do it. What you do need is an old, ornate lamp you’d find at a thrift store, resale shop, or yard sale, and your favorite paint color to give it some pop. Add a crystal basin or other bowl for the water, and your birds will love the opportunity for an elegant bath. Add a bird bath to your vegetable garden or anywhere you want birds to make a splash with a simple tomato cage bird bath. The sturdy wire of the cage provides an easy pedestal for the clay saucer basin. The cage could be trimmed to any height, or you can make multiple baths at different heights to add even more water and character to the garden. Perhaps you already have a heavy concrete bird bath that is showing its age with chips, nicks, or cracks. Give it new glamour with a simple coat of concrete and glittery jewels, with a smaller colorful basin in the middle for a fun focal point. You can even leave the smaller basin loose in the bath so it can be removed for easy cleaning whenever needed.